A user sent us this e-mail about how his home was broken into when he was out of town, and how SmartThings not only sent him an instant alert as soon as the burglars entered, but also scared off his unwanted guests. 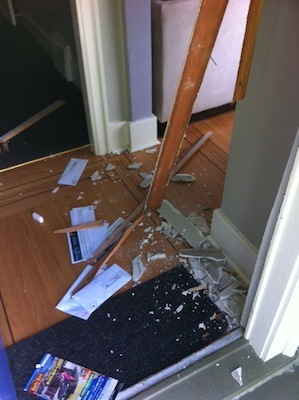 “My house was literally broken into today. SmartThings notified me, and although we never caught the burglars, they didn’t take anything and I’ve got my in-laws fixing the door. I think the robbers were spooked when they saw the SmartSense Multi that had broken off the door. We are out of town until Monday, so if it wasn’t for the SmartThings notification, my door would be opened for whomever for the next four days. So that said, I’m on edge now and want to purchase some security cameras with motion detection. Like Ryan, you can get instant alerts on your smartphone or tablet whenever there’s unexpected movement or when someone attempts to enter through a door or window at your home. While SmartThings can alert you whenever there’s potential trouble back home, it can also deter would-be intruders and act as a home security system. Simply pair your SmartSense Multis to a FortrezZ Siren Strobe Alarm and you’ll not only receive instant alerts about potential trouble, but your home will also sound a loud alarm and flash a red light to scare off trespassers.